Abaton Garage cordially invites you to girl and a gun, an exhibition of recent constructions, paintings and works on paper by New York artist Nora Griffin. This is the artist's first commercial solo exhibition. Nora Griffin draws on an array of diverse sources, including film theory, constructivist art, the late works of Philip Guston and the unruly colored frame paintings of Howard Hodgkin. Working with a variety of mediums, she creates no-nonsense economical pieces which comment on the signs, markings and inherent codes found in abstract picture making. 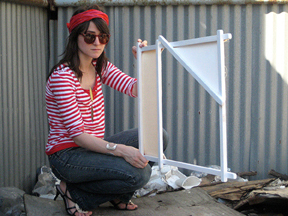 Griffin's approach to the fundamental physicality of how a painting is made and is painted is quite unique among artists of her generation. Please join us for the opening reception of girl and a gun at Abaton Garage on Sunday, September 7th from 3-6pm, culminating in a performance by Marianne Nowottny and Her All American Band Marianne Nowottny & TAAB. From NYC take the Newark-bound PATH train to Journal Square. 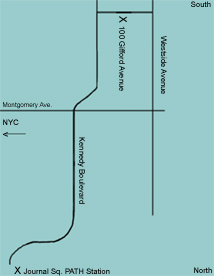 Taxis are available on Kennedy Boulevard, directly in front of the station. 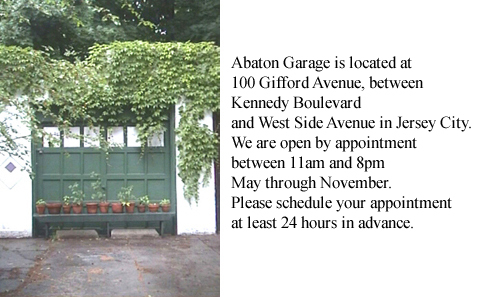 The ride to Abaton Garage takes less than five minutes and costs approximately $7. If you prefer to walk, simply stroll down Kennedy Boulevard about 3/4 of a mile, until you reach Gifford Avenue. Then turn right; 100 is in the middle of the block.